Today was the day we had been waiting for — for a long time! Taormina, our new sailboat— soon to be renamed — sailed from Fort Lauderdale to Dinner Key in Miami with Bob and a captain on board. It took eight hours due to strong headwinds (25 to 28 knots) and the strong Gulf Stream current. Beating into the wind was tiring, but Bob and Captain Gray arrived at 6:30 p.m. to be met by Pat, Alex, Sherry, Angus and Charles. 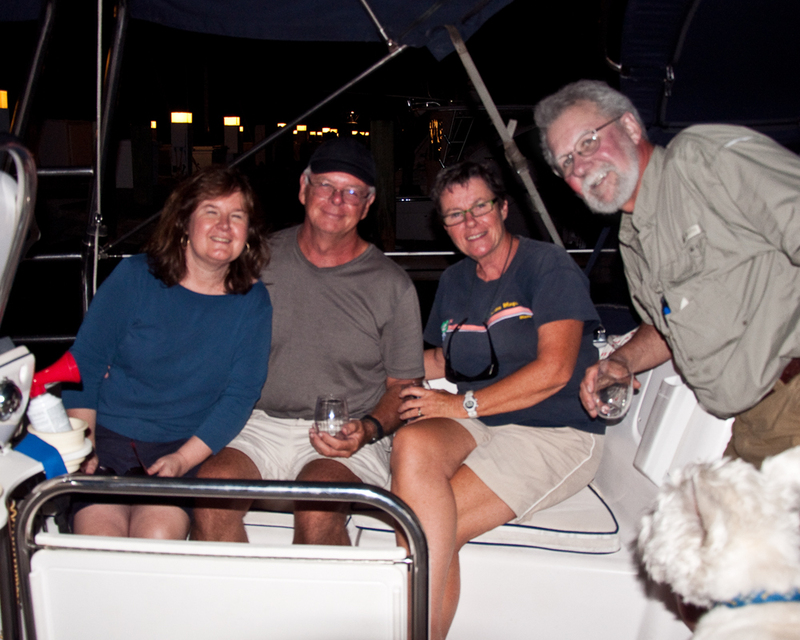 After a celebratory glass of champers and an exchange of sailing stories, Bob and Sherry drove back to Fort Lauderdale with Gray. ← I love orchids, what can I say? Congratulations Sherry & Bob. Your dreams are coming true. We are so happy for you. Keep having fun! Hope to see you too when we get back to Canada. Thanks, Bev. Hope you’re enjoying your final photography course! You guys look happy! Congratulations.